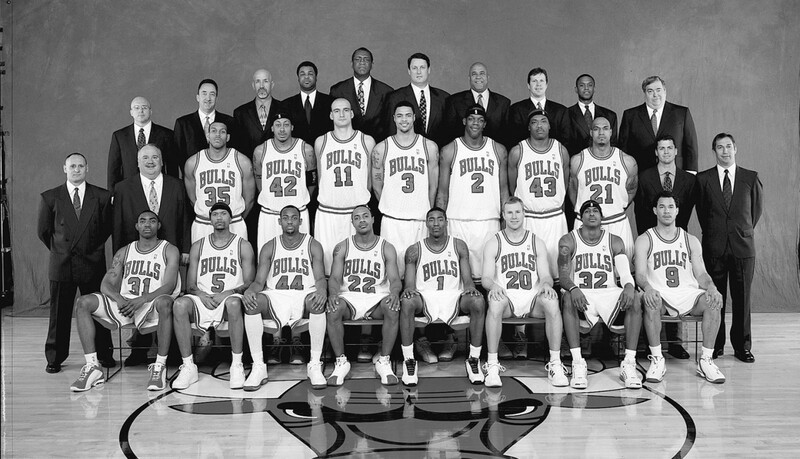 Left to Right: (front row): Roger Mason, Jr., Jalen Rose, Trenton Hassell, Jay Williams, Jamal Crawford, Fred Hoiberg, Eddie Robinson, Rick Brunson. (middle row): Strength & Conditioning Coach Erik Helland, Equipment Manager John Ligmanowski, Lonny Baxter, Donyell Marshall, Dalibor Bagaric, Tyson Chandler, Eddy Curry, Corie Blount, Marcus Fizer, Assistant Athletic Trainer Eric Waters, Head Athletic Trainer Fred Tedeschi. (back row): Strength & Conditioning Assistant Jeff Macy, Scout Gar Forman, Director of European Scouting Ivica Dukan, Assistant Coach Pete Myers, Head Coach Bill Cartwright, Assistant Coach Bob Thornton, Assistant Coach Bill Berry, Assistant Coach/Advance Scout Mike Wilhelm, Special Assistant to Executive Vice President Basketball Operations B.J. Armstrong, Executive Vice President Basketball Operations Jerry Krause. Signed free agents Corie Blount (07/31/02), Donyell Marshall (08/16/02) and Rick Brunson (09/18/02) ... hired Assistant Coach Bob Thornton (07/08/02) and Assistant Coach/Advance Scout Mike Wilhelm (09/05/02) ... began the season 2-0 for the first time since the 1996-97 season ... garnered a franchise-worst 3-38 road record ... held a 19-game road losing streak from 11/02/02 – 01/18/03 ... Marcus Fizer suffered a torn ACL at Portland on 01/31/03 and was forced to miss the final 36 games of the season ... Roger Mason, Jr. missed the first 55 games of the season on the injured list while recovering from shoulder surgery ... appeared in a franchise-record nine overtime games (1-8) ... the team’s 30-52 record qualified it for a fifth-consecutive NBA Lottery appearance. First Round, Jay Williams (Duke); second round, Roger Mason, Jr. (Virginia) and Lonny Baxter (Maryland). Tyson Chandler (Sophomore team) participated in the Schick Rookie Challenge at All-Star Weekend ... rookie Jay Williams was named the NBA’s “got milk?” Rookie of the Month for Dec. ... Williams also (Freshman team) participated in the Schick Rookie Challenge at All-Star Weekend ... Eddy Curry led the league in field goal percentage with .585 shooting from the floor ... the Bulls drew an aver- age of 19,617 fans through 41 home games (fifth in the NBA in attendance) and had 20 home crowds of 20,000 or more (14-6 record), including 12 sellouts.